Synopsis: Eccentric firearm heiress believes she is haunted by the souls of people killed by the Winchester repeating rifle. January and February are generally thought of as a dumping ground, the place where movies are put to underperform between the end-of-the-year awards season and the Oscar blitz. This is particularly true of horror movies. Last January, audiences got a pleasant surprise with Shyamalan’s Split, but more often than not they’re subjected to forgettable flicks like The Forest and The Boy. The mediocrity trend continues this year with Winchester. Based on actual events, Winchester is about the famous Winchester House in Northern California. 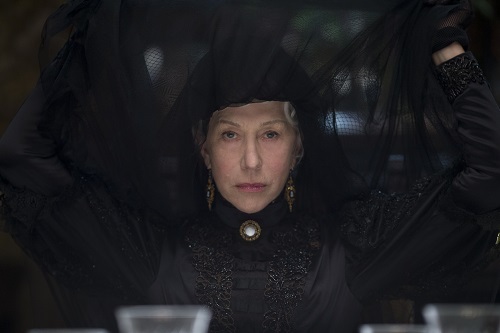 Sarah Winchester (Helen Mirren from Hitchcock and Trumbo), the heir to the Winchester Repeating Arms fortune and half-owner of the company, keeps building onto her massive mansion in an effort to appease the spirits of those killed by Winchester rifles. Dr. Eric Price (Zero Dark Thirty‘s Jason Clarke) is sent by the other owners of the Winchester Repeating Arms company to assess Mrs. Winchester’s mental competence. She regales the doctor with tales of shadows and ghosts, and at first, he thinks that she may in fact be insane. But soon enough, he realizes that there is more than just restless spirits in the house. Something has put a curse on the Winchesters, and wants to take revenge upon Mrs. Winchester’s favorite niece, Marian Jessabelle‘s Sarah Snook), and her son, Henry (Finn Scicluna-O’Prey from “The Secret River”). The Spierig brothers, Michael and Peter, the duo behind last year’s Jigsaw, directed Winchester from a script that they reworked from Tom Vaughan (Unstoppable). The original title for the film was Winchester: The House That Ghosts Built, and although it may be a mouthful, it’s a suitable name. The house is real, as was Sarah Winchester and her reasons for building it, but there is most likely quite a bit of dramatic interpretation within the story. Which is fine, because the Spierigs are, first and foremost, making a movie to entertain. The setup and first act of Winchester are a lot of fun. Dr. Price, himself battling inner demons, is at first in awe of the house, then confused by it, before becoming terrified of it. Unfortunately, by the time he hits that last mark, Winchester has become a typical Hollywood haunted house story, full of all the same spooky spooks and possessive demons that audiences have come to know and love, but have seen done way better in movies like The Conjuring and Insidious. So Winchester just ends up feeling generic and uneventful. Winchester does have its moments, though. 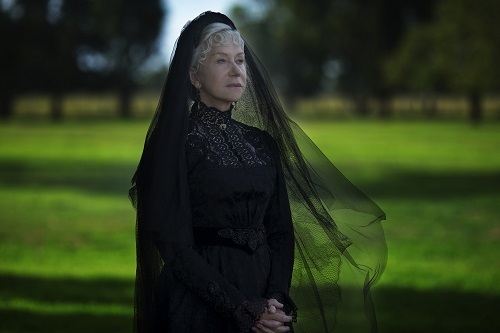 The house itself is an incredible set, and Helen Mirren, even in a pulpy ghost story, brings her all to the role. The plot, while improbable, is solid. It even includes a couple of good twists (although it does milk them heavily for all that they are worth). Winchester will be just as effective on late night TV as it is on the big screen, and while it may not warrant a trip to the theater, what else are you going to see in early February? 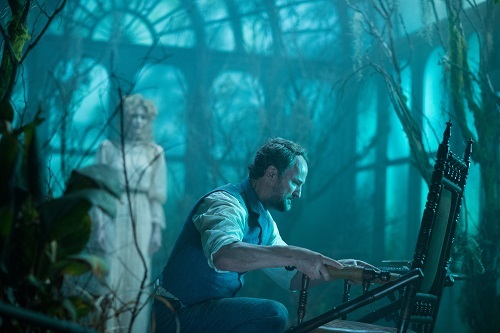 For a movie about a house filled with vengeful ghosts, Winchester is surprisingly tame. There are a handful of fun scares, but they’re mostly built on gags that have been done to death in other movies (although there is a cool mirror scene early on in Dr. Price’s stay that manages to achieve a fresh take on the disappearing ghost motif). The ghosts, unfortunately, look like zombies, but that’s to be expected from the spirits of those who have been shot in the face. Still, the look has saturated pop culture for so long that it’s not scary at all. Aside from a handful of clever jump scares (which are elevated by a very Bishara-esque screechy string score by co-director Peter Spierig), there’s not much to be afraid of in Winchester.